This recently built cottage is located on the same plot as the owners house, in a cul-de-sac, and has a separate entrance as well as a part of the large garden. It is well situated, in the middle of the fields, outside the village of Gramsbergen (Overijssel province). There are a great deal of things to do in the surrounding area: the cottage is located on the Pieter path, close to the river Vecht and beautiful forests; Hardenberg (and its lake) and the German frontier are about 5 km away. Ommen is also close by; Emmen and its zoo ''Wildlands Adventure'' are 25 km away 3.5 km away. You will also be able to go out on some beautiful walks and bike rides. The house is located directly on the Pieter pad, near the Vecht River and beautiful forests, about 5km from Hardenberg (with a recreational lake), 5km from the German border, within driving distance of Ommen and 25km from Wildlands Adventure Zoo in Emmen . There are many cycling and walking possibilty's in the immediate area. Bikes can be rented from the owner. 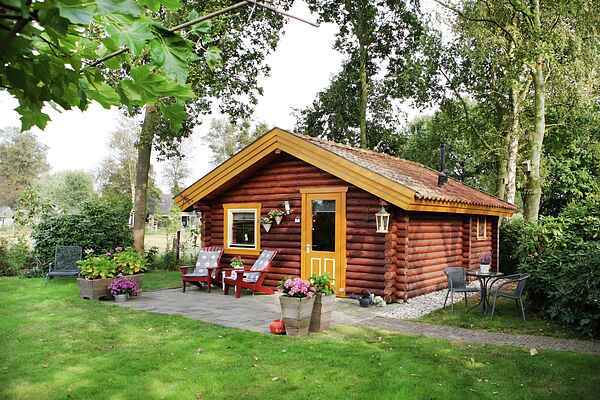 SELF-CATERING LOG CABIN on the edge of a pretty town in the Dutch countryside. Perfect for a quiet, relaxing holiday. The cabin is surrounded by miles of cycling and hiking routes through some of the prettiest parts of rural Holland. Giethoorn ( "Venice of the North" ), Kampen, Deventer and Groningen are within easy reach for day trips. Two of our guests from London, England, had this to say about their stay in "de Tuinfluiter": Dear fam. G. ( 24-08-2006) We came to this quiet corner of the Netherlands looking for peace and quiet- and we found it in 'De Tuinfluiter' cottage. The hosts were very helpful and friendly, the cottage itself very comfortable and well-equipped, and the garden -which we had to ourselves- a real balm for the soul. We had a lovely time exploring the area by bicycle, visiting local markets, shops and festivals and just generally relaxing. We're goning back to the hectic London life with renewed energy! Hesta en Gabriel. 12th-20th July 2007 From Clive & Mila We had a great time, enjoyed every day. What more can we say?..... Clive & Mila. Rochestor, Kent, UK.